Equine sports are highly structured and competitive. Horses and riders are athletes that must stay active and healthy to be successful in a chosen sport. The pressure to be competitive can make it really difficult to take the time you need to process fear and there is less opportunity for the type of slow, easy practice that helps in overcoming fear. It is much easier to ignore emotion and keep riding, especially if the fear is caused by competition. 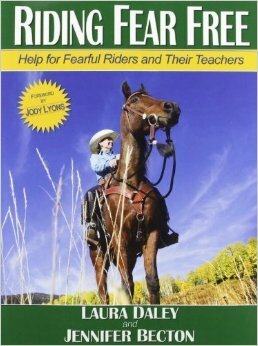 If you want to stay competitive as you work through the Riding Fear Free program, you need to record and analyze every aspect of personal fear. Notice when nerves or excited energy interferes with your thinking and ability to function. Journaling, video and honest feedback from others will also go a long way toward overcoming fears. If you take the time to do these “micro steps,” you will quickly replace tension in that area with good memories. Professional athletes often have a difficult time forgiving themselves for feeling fear or for having an accident. Then, they have a hard time accepting that they need to go back to the basics to rebuild confidence. The basics are things they know by heart, “baby steps” a professional will have previously mastered. It can be hard to go back to the things once practiced as a beginner. Remember, you cannot will away fear. It takes hard work. Those involved in equine sports excel at working hard, however, so harness your inner strength and drive and do the steps necessary to ride fear free once again. Recreational riders have the luxury of time to overcome their fears, but can lack motivation to change. It is wonderful, and often necessary, to take your time overcoming fear, but that process is not very goal driven. Recreational riders must find the motivation to work through their fears so setting goals and pushing boundaries is necessary to make progress. Journaling is a huge help in making goals, marking progress and filling in any holes in the training program to keep you on track.